We announced today an Art Exhibition featuring Artists with disabilities hosted by the Los Angeles City Hall in Los Angeles California, which will be on display during the entire month of October 2017 at the City Hall Lobby on the 3rd floor. The exhibition will feature original paintings, and other works of art by local artists and many other artists from the United States and around the globe. 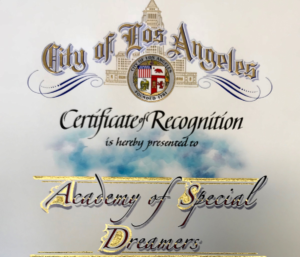 The Academy of Special Dreams Foundation is a California non-profit public benefit corporation based in Pasadena, California, and is recognized as a tax-exempt IRC 501(c)(3) publicly supported charity. The mission of the Special Academy is to increase public awareness, appreciation and recognition of the creative talents of people with disabilities by providing opportunities that encourage, promote and showcase their artistic expressions. More information about the Special Academy can be found at www.specialacademy.org.